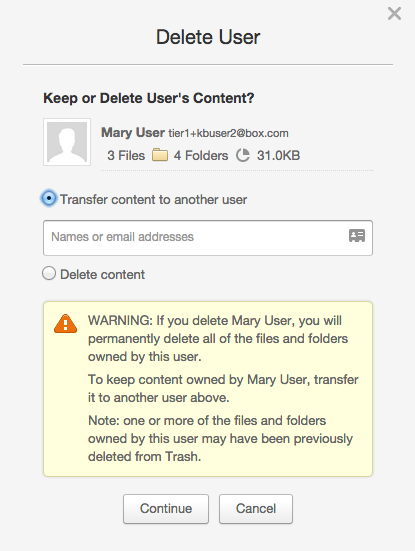 As the Administrator of your organization's Box instance, you can delete managed users and transfer their content to another user in your account. Please note this does not affect either existing collaborations or shared links, so users do not lose access to the content after the transfer completes. Log in to your account and navigate to the Admin Console. In the lefthand navigation, click Users and Groups. Select the user you want to delete. The Edit User Account Details section displays. Click Delete this User. (This link is located between the Status and Language boxes.) You’ll then have the option to transfer any content the user owns to another user, or to delete it entirely. Admin Tip: You may want to transfer everything to yourself and then apportion the content out to other users. A new window displays, indicating the number of files and folders the user owns and the amount of storage space they are using on the account. Here you're presented with the option either to delete the content that the user owns, or transfer it to another user in the account. If you are not prompted with the option to transfer content, then the user you are attempting to delete does not own any content and is currently only collaborating on content. To delete the content, click Delete Content and then click Continue. To transfer the content to another user, click Transfer Content to Another User. To designate a recipient, either type in the email address of another user in your account or click the contact icon to see a list of available users and then click Continue. Any content in the user's trash is transferred and displays in the receiver's trash. You must ensure you're filtering the trash by "Items I own" to see these items. Box does not transfer any trashed items the user does not own. In the final step, the system prompts you to confirm this deletion/transfer, and presents you with the option to notify the affected user or users via email. When you select the users you would like to be notified, click Transfer Content and Delete User to apply the changes. When the transfer completes, the deleted user's content displays in the recipient's root level under a folder titled "[Deleted User's Email] - [Deleted User's Name]'s Files and Folders". Note This process can take some time to complete depending on the amount of content your user owns. The more content they own, the longer it takes to complete. If after you start the process there is no error, but some of the content does not display right away in the new location, please wait up to a day before you contact support. If the process errors out, we suggest first trying to transfer some of the largest folders individually. To do this, follow these steps. If you continue to get an error, please file a support request with Box User Services. Note Transfers are not performed as one single action. Instead, a transfer is chunked into smaller pieces and each piece of work is scheduled separately. As a result, portions of the folder tree display gradually at the destination, until the entire transfer completes. If a deleted user has a lot of content to transfer, we recommend performing the transfer after business hours. Additionally, note that a Co-Admin cannot delete another Co-Admin, and a Co-Admin cannot create content within an Admin's account. From the system's perspective, transferring content to an Admin's account via the delete-and-transfer process is the same as creating content in their account, and will cause an error.